The Cermetek XE5690H is a complete, global modem in a compact, surface-mount module. It covers less than half the board space of the leading competitor and is less than half as thick as well. Only Cermetek offers embedded modems in leadless, surface-mount form. As a result, the XE5690H is not only substantially smaller than the competition but the surface-mount package frees additional space on the bottom of the application board for routing traces or placing components. This space efficient design allows the development engineer greater flexibility in placement of the modem within the host system. The telephone company places a DC “ Battery” voltage across Tip and Ring on public switched telephone lines. The XE5690H operates regardless of the polarity of this voltage. 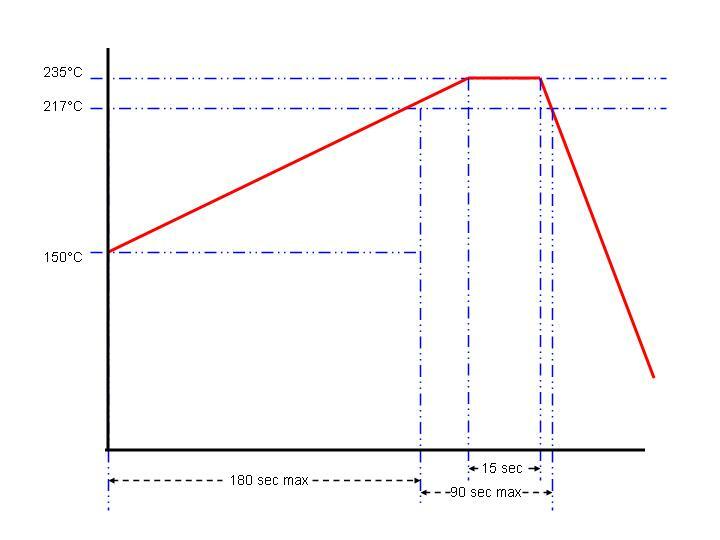 The “ Battery” voltage drives up to 100 milliampere of DC loop current. /DCD is an active low output from the modem. An active /DCD indicates the presence of a valid carrier signal. The AT&C command controls when the XE5690H asserts /DCD. /INT provides an active low hardware interrupt signal from the XE5690H. 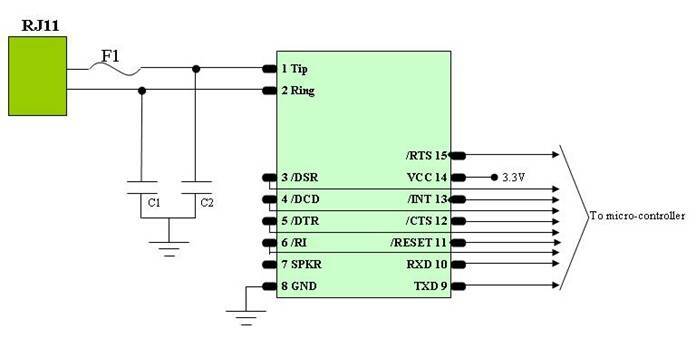 The operation of this interrupt pin is programmable using the modem’s register U70. 1 The XE5690H can be ordered with an Operating Temperature of -40O C to +85O C at extra cost. 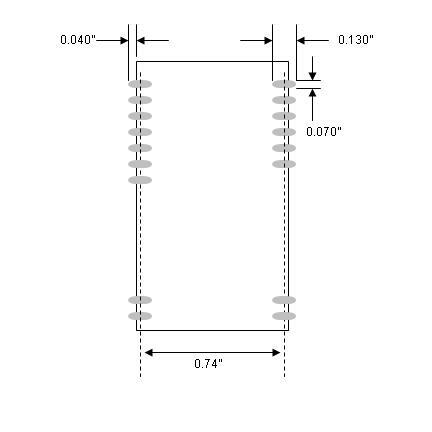 Order model number XE5690H-ITR to specify Industrial Temperature Range (ITR). The XE5690H is subject to damage if over-exposed to heat during solder reflow operations. Following the soldering instructions below will ensure that the process of soldering the module to the board does not damage the modem. The SPKR output on the XE5690H provides a Pulse Width Modulated version of the signal on Tip and Ring. This permits audio monitoring of modem operations through a connected speaker. 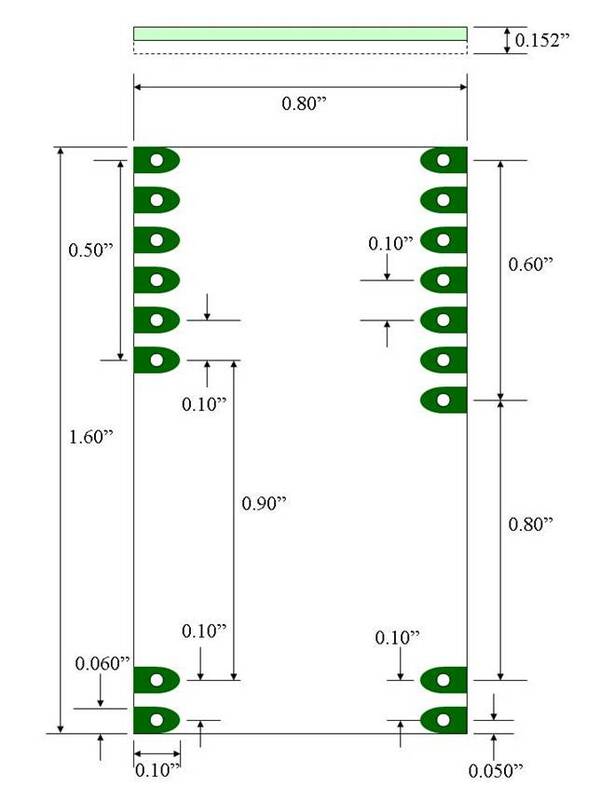 The schematic below shows the recommended circuit for the audio monitor. The following design notes are intended to assist the developer in achieving maximum utility from the XE5690H modem module. The XE5690H can monitor telephone line conditions before, after and during calls. This allows the system to avoid conflicts with other equipment connected to the same telephone line. There are two line monitoring modes; Connect Detect and Handset Interrupt. Connect Detect is active when the XE5690H is on-hook. With AT%V2 selected the XE5690H verifies the availability of the telephone line by checking the DC loop voltage before going off-hook for dialing or answering a call. The nominal value of loop voltage is stored in register U85, typically 48 volts. The XE5690H can detect either the lack of an installed telephone line or that the connected line is in use. If neither the “NO LINE” or “LINE IN USE” conditions is true, the XE5690H goes off-hook and completes the original command. 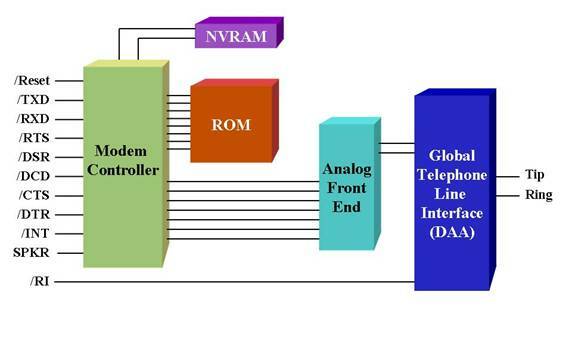 The Handset Interrupt feature permits the modem to yield the telephone line to other equipment connected to the same line. This prevents the XE5690H from blocking outgoing emergency calls when the line is shared as in a residential application including set top boxes and automated meter readers. For Handset Interrupt the modem monitors the loop current while it is off-hook. The Loop current will drop if a piece of equipment connected to the same telephone line goes off-hook. 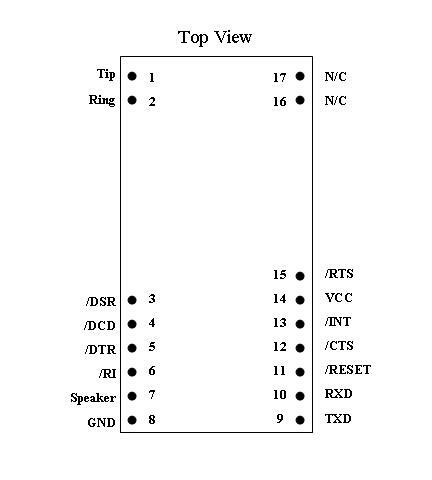 The Handset Interrupt function is controlled by registers U77 and U78. U78 defines when the Handset Interrupt is operable, and U77 allows the operator to configure the modem to disconnect immediately upon detecting another piece of equipment on the telephone line. U77: Bit 11 of U77 sets the XE5690H to automatically disconnect any time another piece of equipment connects to the line while the modem is off-hook. This configuration is recommended when the modem will be sharing a line with a telephone handset as it provides the quickest access to the phone line for emergency calls. If U77 bit 11 is not set, then U70 bit 10 should be. U70 bit 10 causes the modem to provide an interrupt when the off-hook condition of the other equipment is detected. • If only bit 15 is set, the XE5690H activates Handset Interrupt when the timer set by bits 0 to 7 expires. Bits 0-7 set this timer in 500 millisecond increments. The XE5690H uses "AT" commands for configuration and control. This section describes the AT command format and lists the commands, registers and result codes. Command Mode: The XE5690H enters command mode on power-up, reset, a lost connection, or receipt of the escape code. In command mode the modem accepts commands from the host on transmit data. Appropriate result codes are returned on received data. The XE5690H allows a default command string to be automatically loaded into the modem on power-up or modem reset. A series of commands loads the default command string in Hex form into the modem’s EEPROM. The EEPROM has 256 bytes available for command storage. Warning: The XE5690H could be rendered useless by improper use of the Boot command. S42 Blacklisting - S42 controls the Blacklisting in the XE5690H. Blacklisting regulates how frequently the modem can unsuccessfully dial a number. An attempt to dial beyond the limit will result in receipt of the “BLACKLISTED” result code. U65 Modem Power Down: U65 permits the XE5690H to enter power down mode. The modem can only be awakened by applying an active Reset signal to pin 4. U77 Auto Disconnect on Handset Interrupt - U77 bit 11 allows the user to configure the XE5690H to automatically disconnect on a Handset Interrupt condition.